It started in 2010 with a Facebook post. “Who wants to go to the moon?” wrote Yariv Bash, a computer engineer. A couple of friends, Kfir Damari and Yonatan Winetraub responded, and the three met at a bar in Holon, a city south of Tel Aviv. At 30, Mr. Bash was the oldest. “As the alcohol levels in our blood increased, we became more determined,” Mr. Winetraub recalled. They formed a nonprofit, SpaceIL, to undertake the task. More than eight years later, the product of their dreams, a small spacecraft called Beresheet, blasted off on Thursday night atop a SpaceX Falcon 9 rocket at the Cape Canaveral Air Force Station in Florida. If the mission succeeds, it will be the first time that a private company has gone to the moon. It will also be a point of pride for Israel. Until now, only governmental space agencies of three superpower nations — the United States, the former Soviet Union and China — have accomplished an intact landing on the lunar surface. The original goal was to compete in the Google Lunar X Prize competition, which was offering a $20 million grand prize for the first privately financed venture to land a robotic spacecraft on the moon. The founders initially envisioned a tiny lander that would weigh only a dozen pounds, cost just $10 million and make the trip by the end of 2012. The challenge turned out to be much harder and much more expensive. “We didn’t imagine, I think, how much time and effort it would take,” Mr. Damari said. After several extensions, the deadline for the Google Lunar X Prize passed a year ago without a winner. Even without the $20 million prize, SpaceIL persisted. Unlike many of the other competing teams that wanted to build profitable businesses, SpaceIL had given itself a mission, to inspire students in Israel to take an interest in science and engineering. “This is our bigger vision,” Mr. Damari said. SpaceIL would build the first Israeli spaceship to travel far from Earth, but for today’s students, “It's their job to build the next one,” he said. As part of SpaceIL’s parsimonious approach, Beresheet, which means “Genesis” or “in the beginning” in Hebrew, tagged along aboard the SpaceX rocket with an Indonesian communications satellite as well as a small experimental satellite for the United States Air Force. 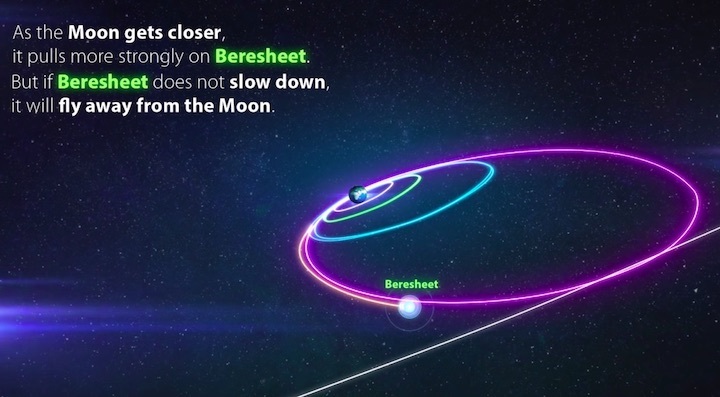 Beresheet will not take the quick, direct path to the moon. That would require a fuel-guzzling firing of a large engine to break out of Earth orbit and then another to slow down at the moon. 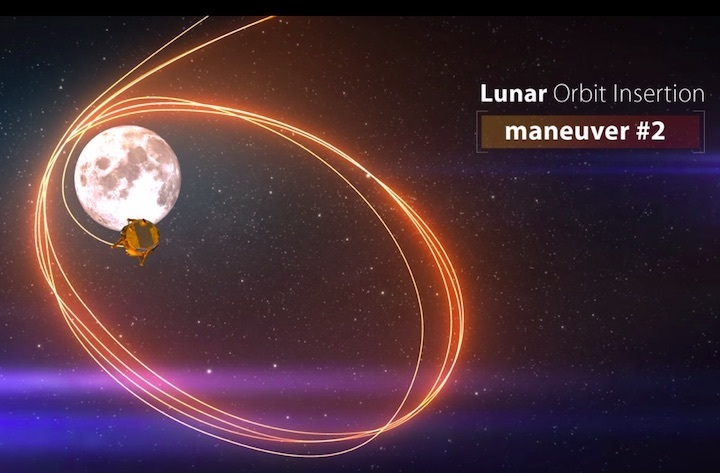 Instead, with several engine firings, the spacecraft will slowly adjust its orbit, stretching to the outermost point until the moon’s gravity pulls it into lunar orbit. That is a long and winding, four million mile-long journey to reach a destination that is a quarter million miles away. In April, it is to land at a lava plain named Mare Serenitatis, or the Sea of Serenity. An instrument built by the Weizmann Institute of Science will measure the moon’s magnetic fields as it approaches, and that data could help give clear hints about the moon’s iron core. Beresheet is also carrying a durable backup of humanity’s knowledge in the form of a disc provided by the Arch Mission Foundation, containing 30 million pages of information, as well as a time capsulewith Israeli cultural symbols and a Bible. Within a few days of its landing, Beresheet is expected to succumb to the heat of lunar noon. Then, its mission will end. The price tag to build and launch Beresheet ended up at $100 million, not $10 million, and the spacecraft bulked up to 1,300 pounds including fuel. The SpaceIL founders point out that this is still much cheaper and smaller than what a space agency like NASA would build. The United States and the former Soviet Union sent robotic landers to the moon beginning in 1966, part of the space race that culminated with the Apollo 11 astronauts stepping foot on the moon in 1969. In 2013, China became the third nation to send a spacecraft to the moon, and this year, it became the first to land one on the moon’s far side. Back in November 2010, it was a rush for the SpaceIL founders just to get to the starting line. The Google competition had been announced three years earlier. About 30 teams had already entered, and the deadline for submissions was the end of the year. From friends and family, Mr. Bash, Mr. Damari and Mr. Winetraub scrounged $50,000 for the entry fee, and on Dec. 31, they sent in the money and the paperwork with less than two hours to spare. From the beginning, their pitch was geared to philanthropists, not venture capitalists. Mr. Kahn became president of SpaceIL and recruited other investors including Sheldon Adelson, a Las Vegas casino billionaire and major donor to the Republican Party in the United States. As a nonprofit, SpaceIL also tapped the energy of volunteers. “If you were interested in space and wanted to do something beyond your day job, you could volunteer and give some of your time,” Mr. Winetraub said. As full-fledged development started, Mr. Kahn brought in Eran Privman, who had been an executive at his companies, to run the organization. But as the 2018 Lunar X Prize deadline approached, the effort appeared doomed. SpaceIL still needed $30 million more. In late 2017, Mr. Kahn resigned. A fund-raising plea by Mr. Privman at the end of that year fell short. 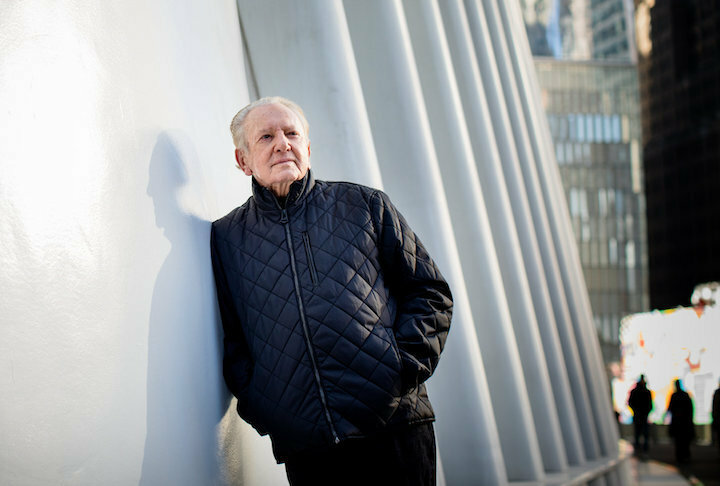 A few months later, Mr. Kahn returned, replacing Mr. Privman with Ido Anteby, a longtime manager at the Israel Atomic Energy Commission, to shepherd the final construction and testing of Beresheet. Mr. Kahn agreed to provide any remaining money needed. And now SpaceIL is approaching its end in a few months. 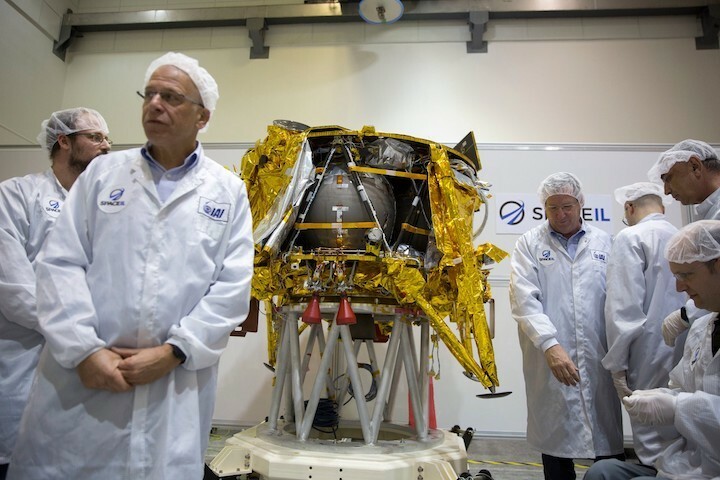 “A day after, all of us will need to look for a job,” said Eran Shmidt, deputy manager of SpaceIL. However, commercial interest in the moon has revived during the Trump administration. In November, NASA announced the selection of nine companies, including several former Lunar X Prize contestants, that will compete for contracts to take small payloads to the moon. The European Space Agency is considering a similar program. Israel Aerospace Industries has signed an agreement with OHB System, a German satellite manufacturer, to compete for the European work, and Mr. Doron said the company is in discussion about collaborating with some of the NASA-selected companies. The SpaceIL founders have largely moved on. Mr. Winetraub is now a graduate student at Stanford, pursuing a doctorate in cancer research. Mr. Bash is chief executive of Flytrex, a company developing drones to deliver consumer goods. Mr. Damari is chief product and strategy officer for Tabookey, a cybersecurity start-up. When they started SpaceIL at the bar, they were all single. “We were in a really different place back then,” Mr. Damari said. On Thursday, he was in Florida to watch the launch with his wife and two children. “I never imagined my big boy is five years old and actually the age he will remember,” Mr. Damari said. An Israeli spacecraft from SpaceIL is scheduled to launch Thursday, Feb. 21 and is aiming to touch down on Mare Serenitatis two months later. 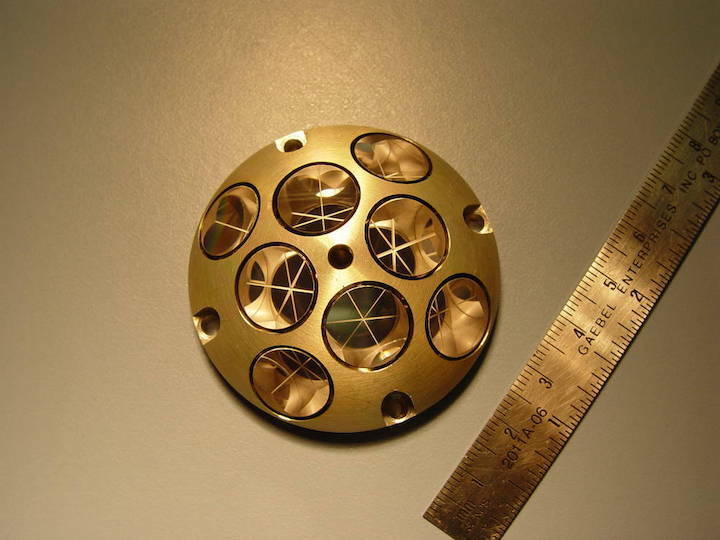 NASA installed a small laser retroreflector aboard the lander to test its potential as a navigation tool. The agency also provided images of the Moon’s surface to help the engineers identify a landing site for the mission. NASA will also use its deep space telecommunications network to transmit images and science data home to SpaceIL and its partners. 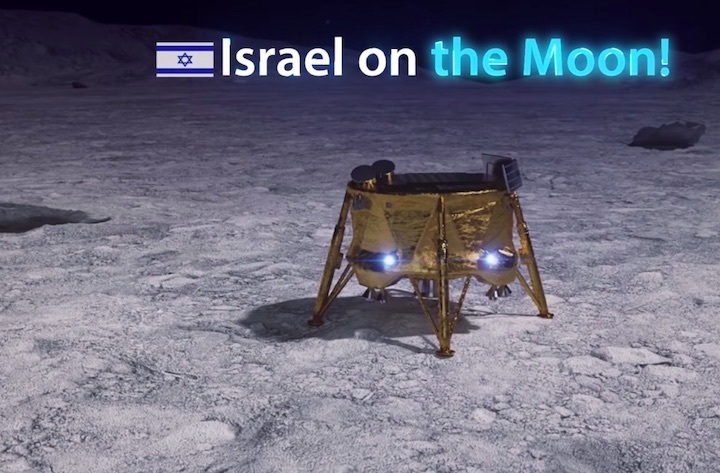 NASA Administrator Jim Bridenstine signed an agreement with the Israel Space Agency (ISA) in July 2018 in order to collaborate with SpaceIL on the mission. SpaceIL will provide NASA scientific data from the spacecraft’s magnetometer as part of the collaboration. 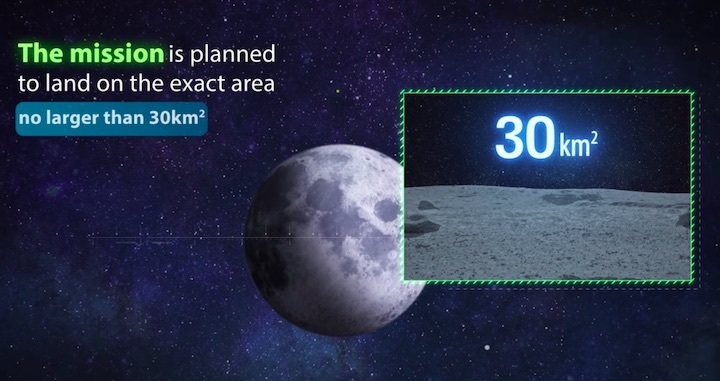 SpaceIL was established in 2010 to tackle the Lunar X Prize, a competition sponsored by Google that challenged private companies to land a spacecraft on the Moon. Though no company was able to meet the competition deadline, prompting Google to end it with no winner in March 2018, the Israeli team pressed on. But no company can make it in space alone. 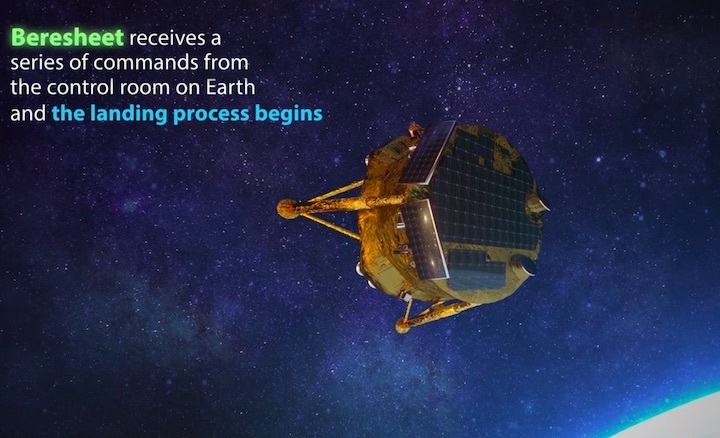 SpaceIL will rely on the Swedish Space Corporation’s network of antennas to communicate navigation commands to the spacecraft and to track its trajectory. Once the spacecraft lands, NASA’s Deep Space Network (DSN) will ferry data between it and Earth. DSN is a system of global antennas managed by NASA’s Jet Propulsion Laboratory in Pasadena, California, that scientists use to communicate with spacecraft in deep space. The SpaceIL mission advances a partnership between NASA and ISA as both agencies will share the resulting discoveries with the global scientific community. “The team’s tension level is high, but we’re also very, very excited” said Eran Shmidt, deputy manager and head of the ground control team at SpaceIL, the Israeli nonprofit that built the Moon lander, called Beresheet, or “genesis” in Hebrew, in partnership with Israeli-government-owned defense contractor Israel Aerospace Industries. 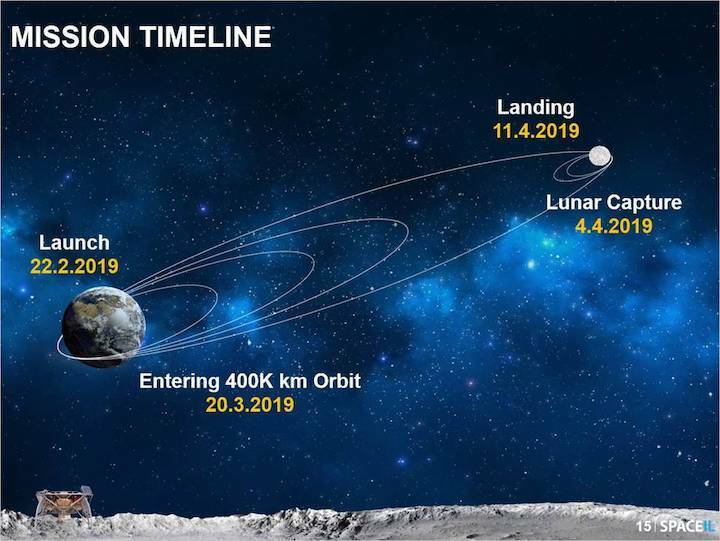 A graphic showing Beresheet's path to the Moon. Dates correspond with Israel Standard Time. Beresheet — about 5 feet (1 meter) tall by 7.5 feet (2.3 meters) wide with its landing gear and legs deployed — is one of two payloads that will hitch a ride aboard the Falcon 9 today. The other payload is an Earth telecommunications satellite. The lander will separate first from the rocket, taking the long route to the Moon to save fuel by employing gravitational forces to propel itself. 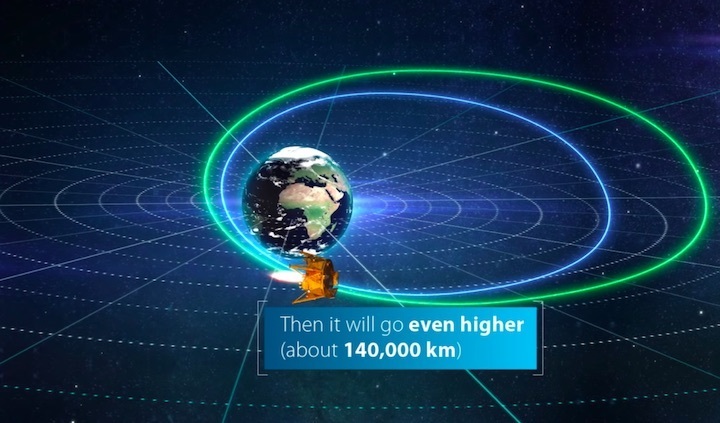 Thus, Beresheet will stay in Earth’s orbit for about a month, slowly widening its ellipse until it reaches apogee, or its farthest point from here, at nearly 250,000 miles (400,000 kilometers) away. The SpaceIL team will need to time Beresheet’s apogee precisely to meet up with the Moon in its orbit about Earth. At this point, the navigators can slow the spacecraft to allow it to be captured by the Moon’s gravity and thereby pulled into its orbit. Beresheet is due to touch down between April 11 and 12 in a dark patch of an ancient volcanic field visible from Earth, known as the Sea of Serenity (Mare Serenitatis in Latin). NASA’s Apollo 17 astronauts landed near this region on Dec. 11, 1972. Now, Beresheet will have an opportunity to mark a new first in space exploration with its landing. Though the primary goal of its mission is to land safely, the spacecraft will attempt to do science in orbit, during landing, and on the ground. The window of opportunity for research is small, though: just three Earth days maximum after landing that the spacecraft can withstand the crushing heat — 212 degrees Fahrenheit (100 degrees Celsius) at local noon — of the lunar day (14 Earth days). But every second counts to scientists back on Earth. 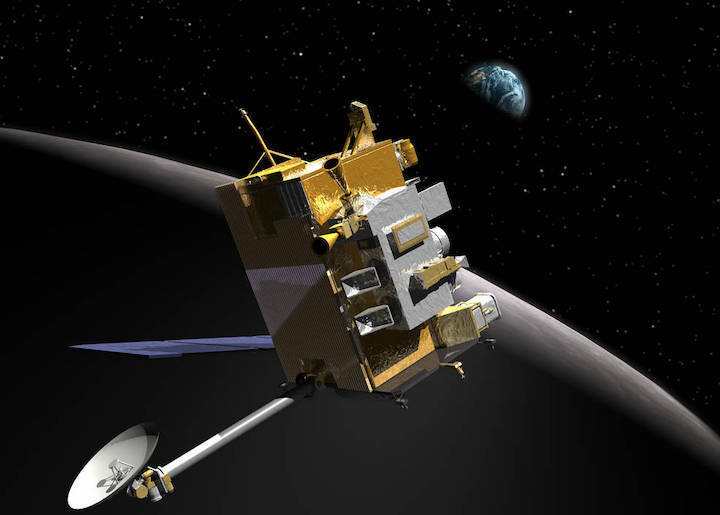 NASA’s Lunar Reconnaissance Orbiter (LRO), one of the agency’s three spacecraft circling and studying the Moon, will analyze the gases released by Beresheet’s descent engine as the lander approaches the surface. Illustration of the Lunar Reconnaissance Orbiter. Meanwhile, scientists from the University of California in Los Angeles, Israel’s Weizmann Institute of Science, and from other global organizations will rely on data from Beresheet’s magnetometer to study whether Moon rocks contain a history of the magnetic field there. Another experiment on Beresheet will involve a tiny but robust instrument called a Laser Retroreflector Array. Smaller than a computer mouse, this device features eight mirrors made of quartz cube corners that are set into a dome-shaped aluminum frame. This configuration allows the device to reflect light coming in from any direction back to its source. LRO’s laser altimeter, an instrument that measures altitude, will try to shoot laser pulses at Beresheet’s retroreflector and then measure how long it takes the light to bounce back. By using this technique, engineers expect to be able to pinpoint Beresheet’s location within 4 inches (10 centimeters). One day, this simple technology, requiring neither power nor maintenance, may make it easier to navigate to locations on the Moon, asteroids, and other bodies. It could also be dropped from a spacecraft onto the surface of a celestial body where the reflector could help scientists track the object’s spin rate or position in space. “It’s a fixed marker you may return to it any time,” said David E. Smith, principal investigator of the Lunar Orbiter Laser Altimeter, or LOLA, on the LRO. Laser retroreflectors have already been instrumental to space exploration. Apollo- astronauts left three large reflector panels at various Moon locations 50 years ago. They’re still reflecting light today, with their 100 mirrors each, though they’re reflecting light all the way back to Earth instead of a close-by orbiter. Using these mirrors, scientists have learned many things about the Moon, particularly that it is moving away from Earth at a rate of 1.5 inches (3.8 centimeters) per year. These days, smaller laser reflectors are commonly used to track Earth-orbiting satellites from the ground and have been included on several recent space missions. NASA installed an Italian Space Agency-provided retroreflector on the deck of the InSight lander, which arrived on Mars in November 2018. Though there’s no orbiter with a laser instrument at Mars today to shoot light to InSight’s reflector, scientists expect that there will be one in the future. In Beresheet’s case, too, the reflector will live on forever, even though Beresheet is expected to stop working within a few days of landing. It may be a simple dome of mirrors, yet Beresheet’s reflector may be one of the first flickers of light future explorers undertaking NASA’s Moon to Marsexploration will see as they descend to the Moon in the coming decade. Banner image: A false color view of the Moon's southern latitudes. The large blue area at the bottom of the frame is the South Pole-Aitken Basin, an enormous and very old impact feature on the far side of the Moon. 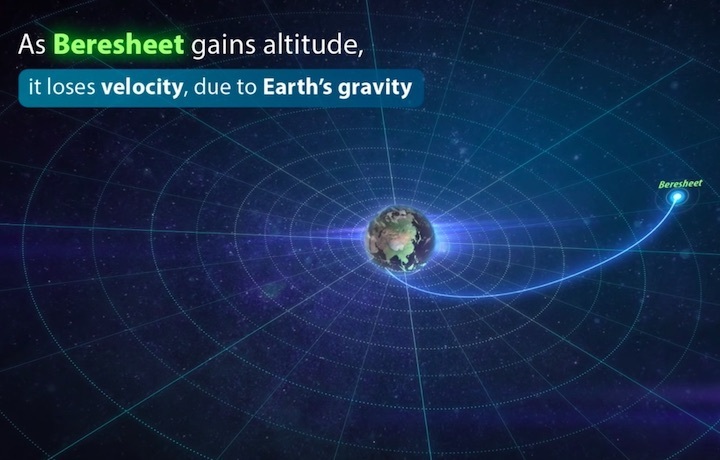 Credits: NASA/Goddard Space Flight Center Scientific Visualization Studio. "What it means to me is that the responsibility is very high." Hayan said the launch is usually one of the most stressful parts of a space operation, but because they have outsourced the launch to the commercial space company SpaceX, the Israeli engineers couldn’t do anything except sit back and watch the launch, hoping for the best. “We had a successful launch, we were injected into a good orbit, separated well, and have good communications,” said Dr. Ofer Doron, the general manager of the Space Division at Israel Aerospace Industries, after Beresheet separated from Falcon 9. Hayan said the project’s shoestring budget of $100 million for development and production was limited by what they were able to fund raise. In comparison, NASA space shuttles cost about $1.5 billion, including development. One of the requirements for participation in the Google LunarX challenge was that the entry not be associated with a government. Google ended the LunarX contest in 2018 with no winners. The Israeli government eventually contributed about NIS 7.5 million ($2 million), said Hayan. “We will never be NASA, we are a small country, with a small budget,” said Hayan. “The percentage of our space budget to the GDP is much smaller than other Western countries.” However, Beresheet set out to prove that space travel could happen on a budget, without billions of dollars of government support. Miller has spoken to a range of groups, from 800 soldiers in the air force to engineers and school kids. The initiative also does outreach with special needs groups. 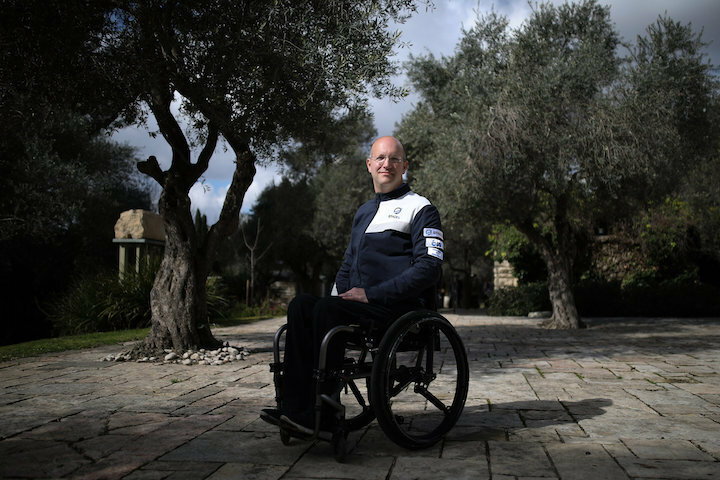 “When we do talks with special needs groups, we teach them to count backwards, which can be very challenging for them, because we want them to feel like they are part of the launch,” said Dr. Ofer Doron, the general manager of the Space Division at Israel Aerospace Industries. 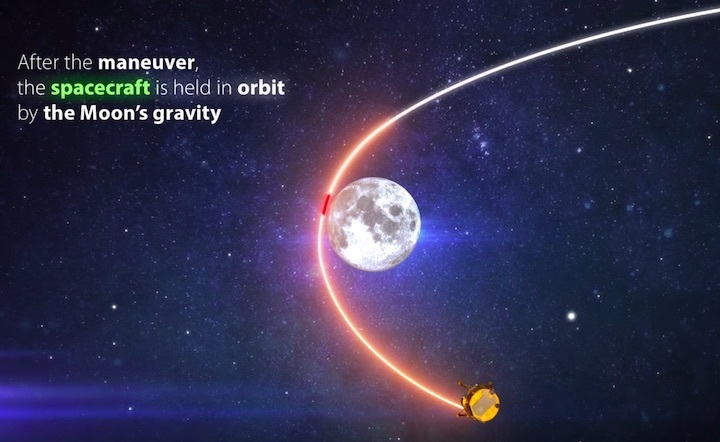 Israel’s first lunar spacecraft, Beresheet (“Genesis” in English), successfully completed its first maneuver toward the Moon after detaching from its launcher and completing its planned orbit of Earth. 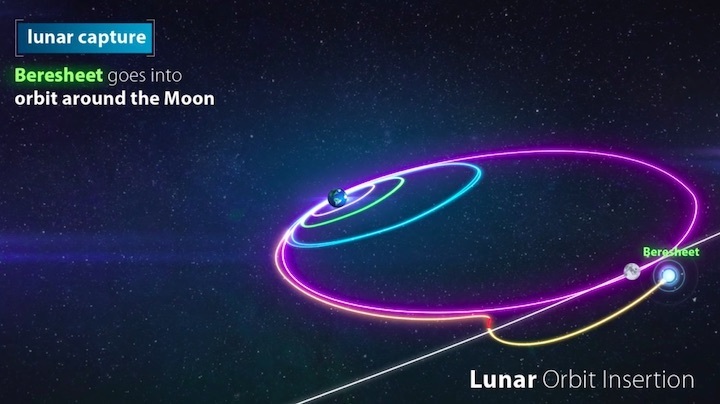 The lander will be captured by the moon when the lander's orbit around the Earth takes it into close proximity to the moon (which also orbits the Earth). After two months, it is set to land in the Sea of Serenity, on April 11. 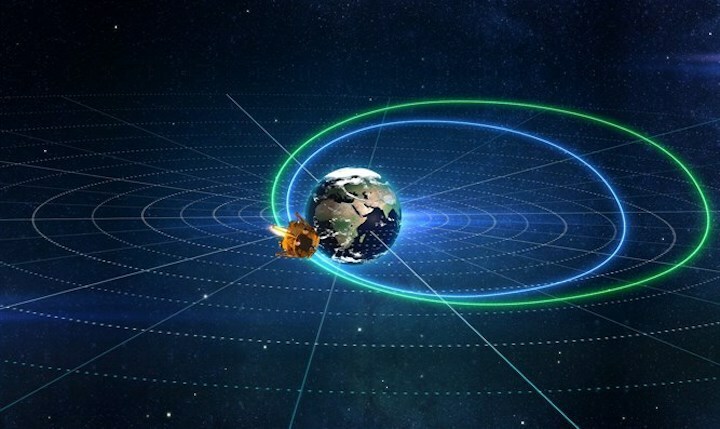 Scientists and technical staff at Israel Aerospace Industries headquarters were notified of the spacecraft’s high sensitivity toward the sun’s rays in the star trackers on board, but are hopeful that this issue can be resolved en route to the Moon. Sunday’s maneuver toward the Moon took into account those problems identified by the star-tracker systems, and scientists decided to move forward with the mission. 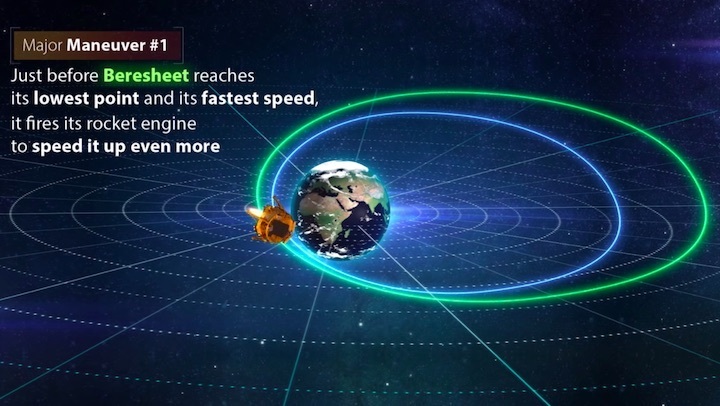 Beresheet, with the go ahead from mission control, turned on its engine for the first time and successfully made its first maneuver toward the Moon just 69,400 km. (43,000 miles) from Earth’s surface. 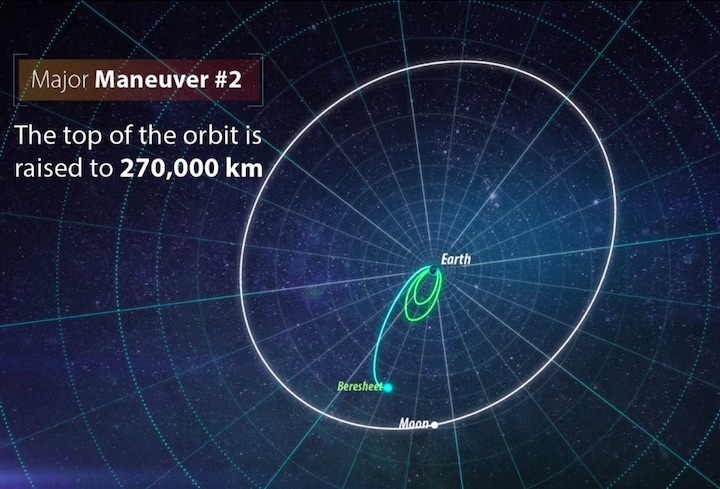 The spacecraft during this maneuver will at some point will come within 600 km. of Earth’s surface as it prepares for its next planned maneuver on Monday night. Israel made its first step to the Moon late Thursday night, as the lunar spacecraft launched from Cape Canaveral, Florida, in a mission that, if successful, will place the Jewish state in an exclusive club of nations capable of landing on the lunar surface. If successful, the landing on the Moon will make Israel the fourth country to land on the lunar surface, after the former Soviet Union, the United States and China. It will be the first such space capsule to land on the Moon as the result of a private initiative, rather than a government-funded enterprise. The project has been spearheaded by SpaceIL and Israel Aerospace Industries and has been in the making for several years. “Eight years ago, we ventured on this journey that is now nearing completion.... I couldn’t be prouder than to give this gift to the people of Israel,” SpaceIL’s president and its largest funder, Morris Kahn, said. Other donations came from Dr. Miriam and Sheldon Adelson, the Science and Technology Ministry, the ISA, the Weizmann Institute and various private individuals. The spacecraft is the smallest such craft by weight (around 1,300 lbs.) and measures only 1.5 meters by 2 meters. It cost only $100 million – far less than other larger and more expensive lunar spacecraft. 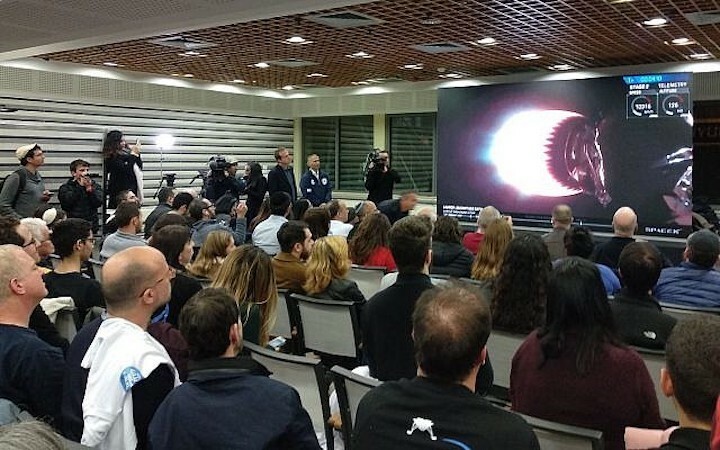 “For many months, our teams and IAI’s were engaged in testing the spacecraft and its systems, conducting complex experiments and preparing for every possible scenario of the mission,” SpaceIL CEO Ido Antebi said. 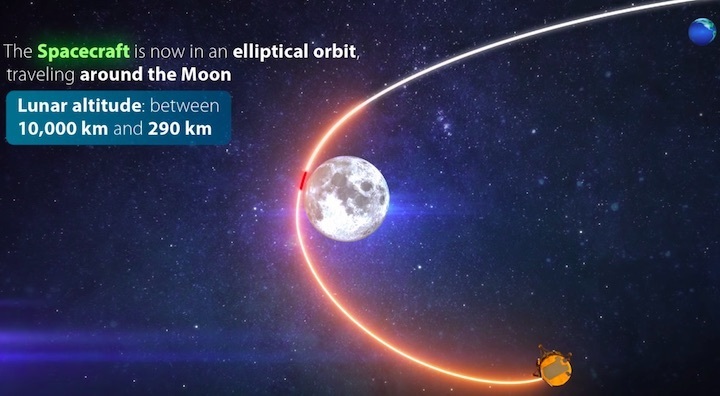 The spacecraft will traverse the longest distance ever to the Moon – some 6.5 million km. (around four million miles) before it lands. 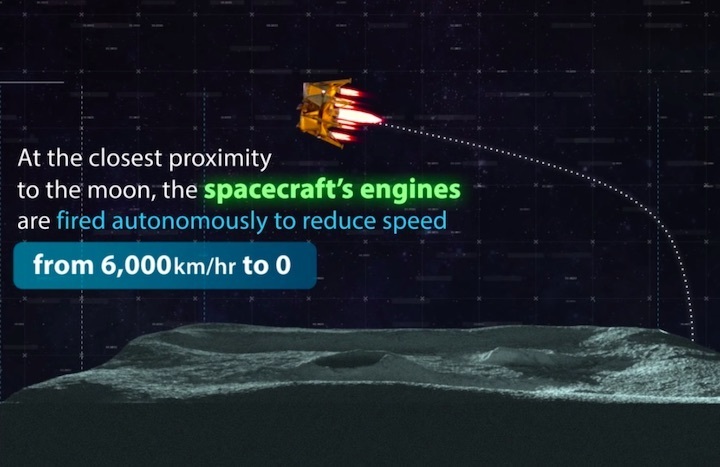 Beresheet will hurdle through space at up to speeds of 10 km. per second (36,000 km/hr). Earlier this week, President Reuven Rivlin noted that not only is this a national and historic achievement, it also aims to inspire young Israelis to study STEM-related (science, technology, engineering, and mathematics) fields and pursue their dreams of space travel. In addition, the craft holds a “time capsule” of hundreds of files digitized on a disk, and contains drawings by Israeli children, the Bible, the national anthem, prayers, Israeli songs and a map of the State of Israel, along with other cultural items. Beresheet is scheduled to be stationed on the Moon for generations to come. A hitch in computer systems Monday evening caused an Israeli lunar spacecraft to miss a scheduled adjustment in its trajectory en route to the moon, engineers reported on Tuesday. The maneuver by the Beresheet craft was postponed after the space vehicle’s on-board computer executed an independent restart. As a result, the craft automatically canceled an engine burn scheduled to keep it on track for an April lunar landing. “At the moment we are not very worried. Of course it isn’t nice, but we are still optimistic,” said SpaceIL CEO Dr. Ido Anteby. Engineers on Tuesday were still examining the data to figure out what happened. Opher Doron, the general manager of the Space Division at Israel Aerospace Industries, said that the engineers had not encountered a similar problem during simulations. The spacecraft is still set to land on the moon on April 11, as engineers built in a number of buffer days in case of delays, said Doron. 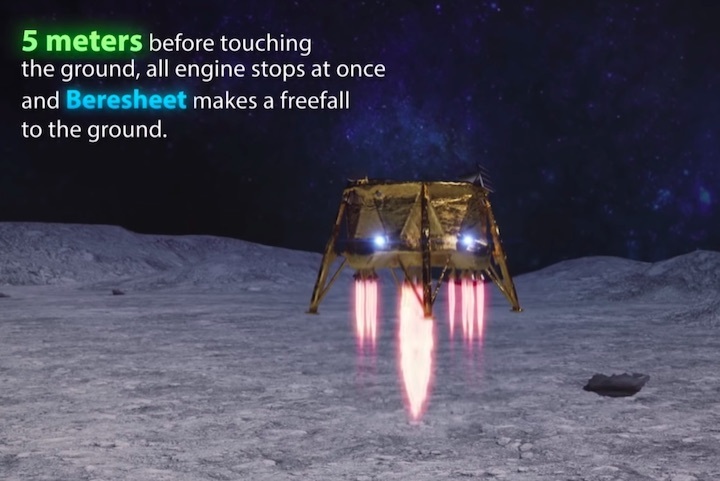 Beresheet is headed to the moon through a roundabout path that helps the tiny spacecraft, about the size of a car, save on fuel. The spacecraft will circle Earth six or seven times in a series of growing ellipses before jumping into the moon’s orbit on April 4. 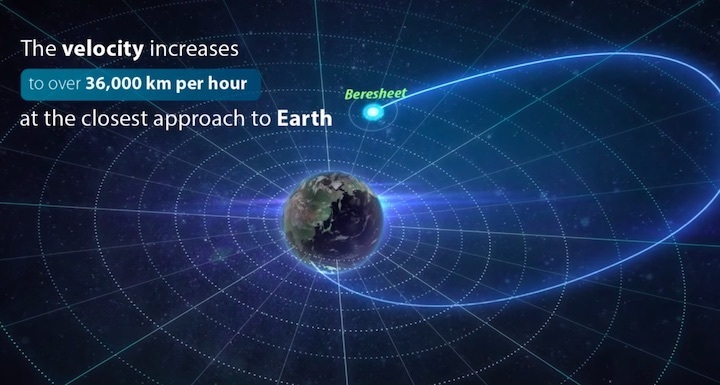 The setback came a day after Beresheet successfully completed its first maneuver by firing its engine while tens of thousands of miles away from Earth. 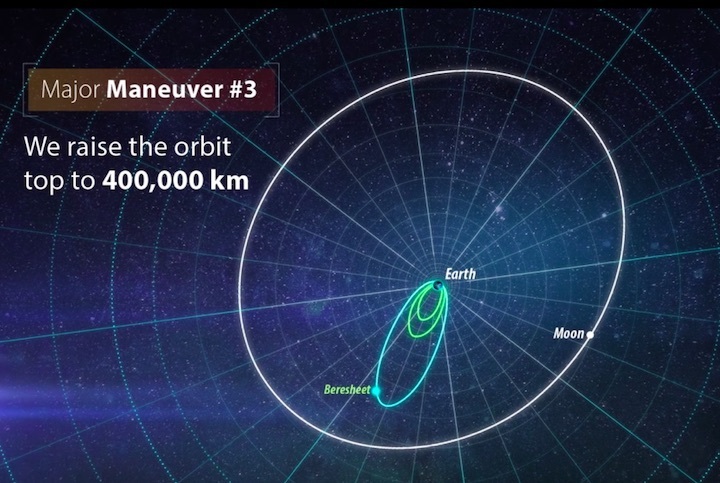 The first maneuver was at the furthest point in the first ellipse, nudging the spacecraft toward a second, larger ellipse. 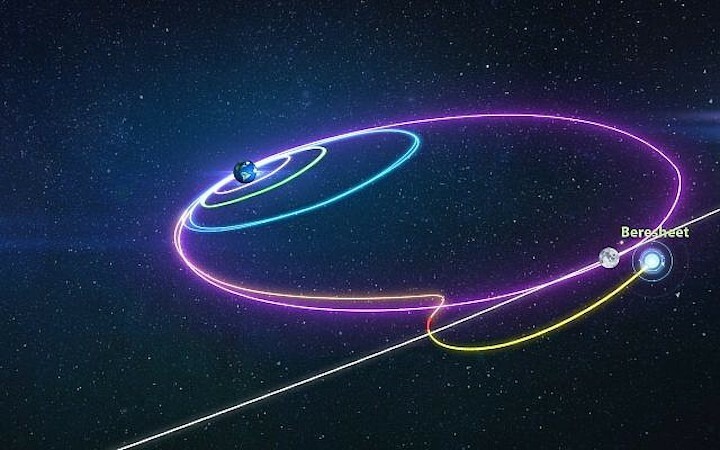 The second maneuver, set for late Monday night, was scheduled to take place at the closest point to earth along the first ellipse, just 600 kilometers (370 miles) above the northern hemisphere. 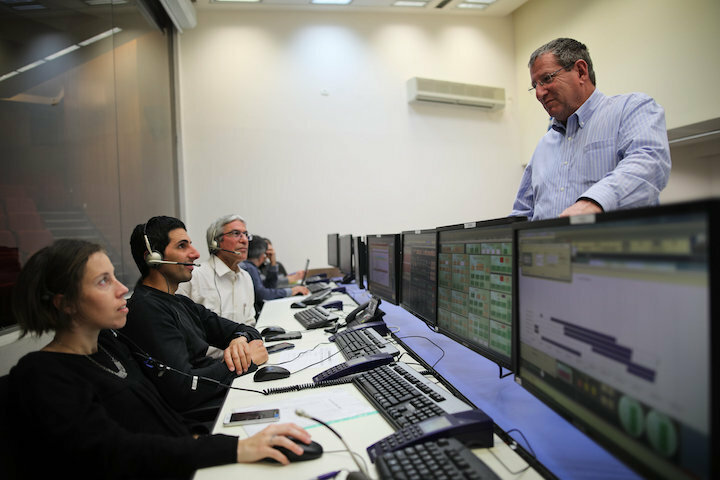 Following the successful launch of Beresheet into space early Friday morning, the team in the control room began looking into a small problem with its star navigation system. 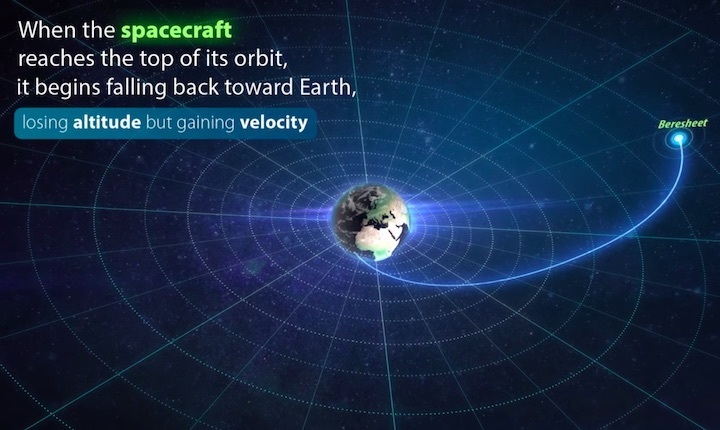 The navigation system allows the spacecraft, which is spinning in space, to figure out its orientation. Understanding the orientation is crucial for a number of operations, including ensuring that the onboard engines that direct the spacecraft to the correct trajectory are activated in the right direction. Anteby said on Tuesday that engineers were checking to see if the involuntary reset was a side effect of the issues with the star navigation system. Aviv Priel, an engineer who is part of the team that controls the spacecraft’s maneuvers, said the team had discussed whether to put off the planned maneuvers while trying to understand more about the star navigation issue. Priel said the team believes glare from the sun on the the spacecraft’s sensors is making it more difficult than expected for the spacecraft to orient itself according to the position of the stars. However, he added that the issue only happens at certain angles, and the team thus far is able to manipulate the spacecraft to obtain a full reading. “The thing with the star tracker is it brought a lot of uncertainties with the first maneuver,” said Priel, referring to the successful maneuver on Sunday. “At some points, we weren’t sure if we should put it off. But we overcame it, we implemented it, and it was beautiful to see. During the [first] maneuver we had online communication — not immediately, with about a two-second delay, but we saw it almost real time. Beresheet, which means “Genesis” in Hebrew, lifted from Cape Canaveral atop a Falcon 9 rocket from the private US-based SpaceX company of entrepreneur Elon Musk. If successful, Beresheet will make history twice: as the first private-sector landing on the Moon, and the first from Israel. Beresheet, Israel's first lunar lander spacecraft, misses planned maneuver after computer suddenly shuts down. Israel’s Beresheet spacecraft, an unmanned vehicle slated to land on the moon, missed a scheduled maneuver Monday night, after the spacecraft’s computer system suffered an apparent glitch, resetting itself unexpectedly. In a statement Tuesday morning, SpaceIL and Israel Aerospace Industries (IAI) engineers said they were investigating the malfunction, but said that other than a known problem with the navigation system’s star tracker, the Beresheet’s systems were all functioning properly. The maneuver was scheduled to take place Monday night, as the spacecraft passed near the Earth in an area where the Ramat Gan-based SpaceIL ground crew would not be in direct communication with the craft. During the pre-maneuver phase, the spacecraft computer reset unexpectedly, and the maneuver was automatically cancelled. “The engineering teams of SpaceIL and IAI are examining the data and analyzing the situation,” the control team said in a statement Tuesday. Last Thursday night (local time), the Beresheet was launched from Florida’s Cape Canaveral, kicking off Israel’s first lunar landing mission. 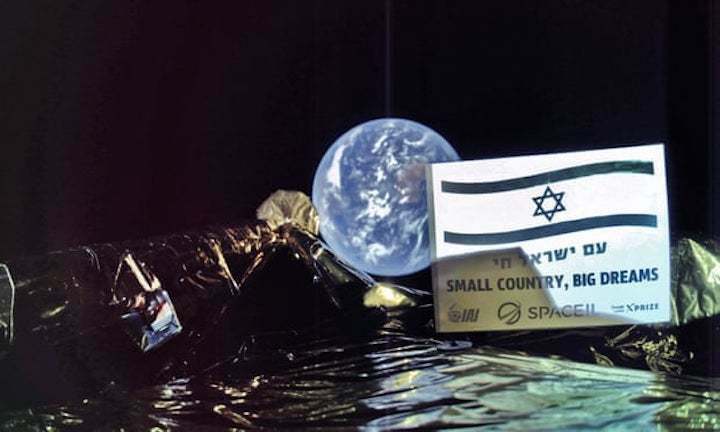 The Beresheet, built and operated by the private Israeli firm SpaceIL, is the first Israeli-built spacecraft. Israeli moon mission appears back on track, as lander completes maneuver, days after malfunction caused shutdown. srael’s first mission to the moon appeared to be back on track Thursday, following a malfunction earlier in the week which forced the cancellation of a planned maneuver. On Thursday, SpaceIL, the private Israel firm which designed the Beresheet unmanned lunar lander spacecraft, announced that the craft had successfully completed its latest maneuver at 9:30 p.m. Israeli time. 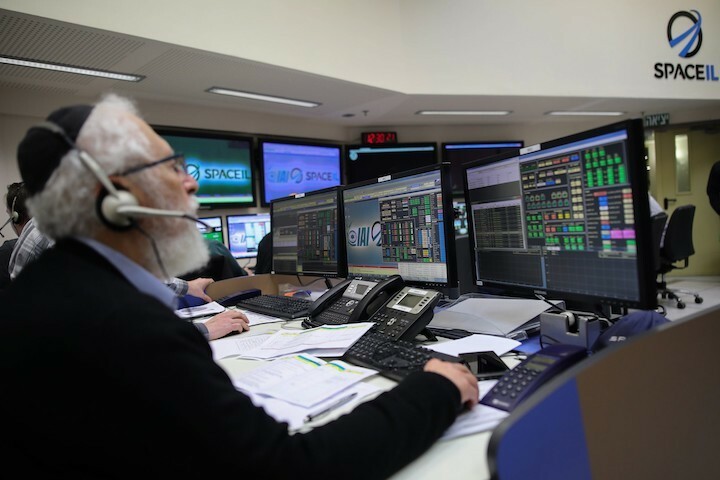 The Beresheet control team, centered in Ramat Gan, Israel, had been working since Monday night to investigate and correct a glitch which had caused the spacecraft to malfunction, preventing it from completing a maneuver. 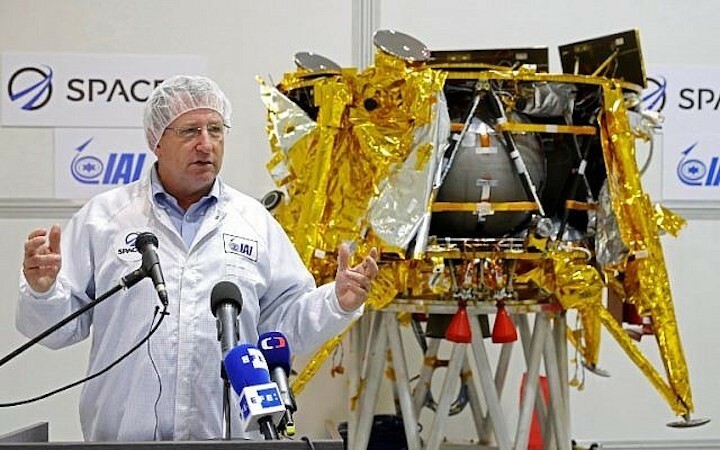 By Thursday night, however, the SpaceIL team said that it had completed its investigation into the malfunction, and had taken “corrective measures”. The image showing part of the Beresheet spacecraft with Earth in the background was beamed to mission control in Yehud, Israel – 23,360 miles (37,600km) away, the project’s lead partners said. The partners, NGO SpaceIL and state-owned Israel Aerospace Industries, launched the unmanned Beresheet – Hebrew for Genesis – from Cape Canaveral in Florida on 22 February. The 585kg (1,290lb) craft took off on a Falcon 9 rocket from the private US-based SpaceX company of entrepreneur Elon Musk. The trip is scheduled to last seven weeks, with the Beresheet due to touch down on 11 April. So far, only Russia, the US and China have made the 239,000 mile (384,000km) journey and landed on the moon. The Israeli mission comes amid renewed global interest in the moon, 50 years after American astronauts first walked on its surface. China’s Chang’e-4 made the first-ever soft landing on the far side of the moon on 3 January, after a probe sent by Beijing made a lunar landing elsewhere in 2013. 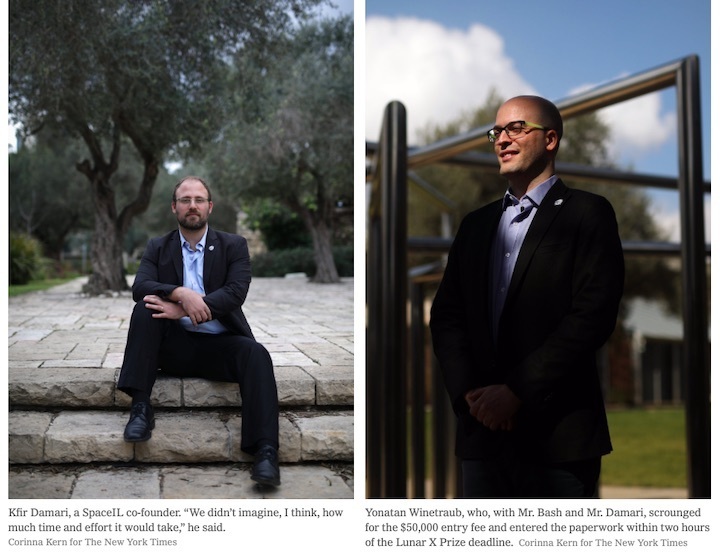 It also carries a time capsule loaded with digital files containing a Bible, children’s drawings, Israeli songs, the recollections of a Holocaust survivor and the Israeli flag. Japan plans to send a small lander, called Slim, to study a volcanic area in about 2020-21. As for the Americans, who have not been back to the moon since 1972, a return is now the official policy of Nasa, according to guidelines issued by Donald Trump in 2017. Nasa, which has installed equipment on Beresheet to upload its signals from the moon, has invited private sector bids to build and launch the American probes.